I started this post Wednesday. I see the world the way you do, I’ve carefully considered every element of this proposal and understand it as well as you do and I hate it and I hate you. Thursday afternoon, Jonathan Fields’ “When No Means Go” arrived in my in box. Seems a few of us have no on the mind this week. As the third one in the ring . . . It’s the reaction to no that’s been on my mind. A few years ago, a dying car sent me into a car dealership for a new set of wheels. While filling out the financial forms, the car salesman asked about my work. I smiled politely and asked if I had signed all the right boxes. Guess who drove her husband’s car to the dealership and then sped off after he went inside and picked up the new car. . . .
“Why didn’t you tell him no?” my husband asked. I’ve always had a hard time saying no. 1) I like helping friends, family, colleagues, causes . . .
2) I don’t like dealing with the response to no. Jonathan’s piece does a great job of explaining his reasons for saying no, so I won’t go into them here. Read his post and know that bandwidth is in my vocabulary, too. Instead . . . That reaction to no . . . Earlier this year, I was told no in response to a project on which I’d been working. I’ve been told no before. Who hasn’t? However . . . The way this one arrived was a first. My response ran like Elisabeth Kubler-Ross’ five stages of grief, except without “bargaining” and repeat visits from “Denial” and “Anger.” I understand the no now, but at the time . . . I couldn’t get my head around the emotions. During the release of The Authentic Swing, when I responded with a few no’s myself, I got it. And then Steve’s interview with Oprah followed, which buttressed the Steve’s-doing-interviews-now thinking—and I responded with more no’s and explained that the interview with Oprah wasn’t about launching a new book. The close timing for the launch of the book and the interview was a coincidence. Around that time, Glenn Reynolds‘ producer contacted us about Glenn visiting Los Angeles. Would Steve have time to meet up? Glenn has interviewed Steve in the past, but they’ve never met in person. Yes, he replied and Glenn’s producer and I booked the interview. Earlier in the year, Aubrey Marcus reached out to share his work with Joe Rogan and the possibility of scheduling an interview. Joe’s also located in the Los Angeles area, soo . . . If Steve was breaking for one interview. Would he do two, if we could book them close together? He did, a day apart, enjoying both, and then went back to work. More requests came in—and I understood why. For the most part, those told no understood, but . . . It was painful to read because I understood where he was coming from. No feels like a personal rejection. He made the no about him. And then he made Steve’s yes to Oprah about him, too. Those answers weren’t about him. They were about Steve, his time, and his work. It’s easier to write this than it is to put it into practice, but . . .
You have to move beyond no. If you don’t, it will devour you from the inside out. For those saying no: You don’t owe anyone anything, but . . . be nice. Think about how you would want to be told no yourself. In Steve’s case, he’s aware that people want him to say yes, which is one reason the “Ask Me Anything” audio series was launched. It’s an opportunity for Steve to connect with readers and answer their questions, but on his time. He’s done one hour-long session so far, with more to come. When I respond no on Steve’s behalf, or for other clients, or my own personal projects, I try to make the no’s shared as nicely as possible, thinking about how I’d want to receive them myself. I believe in the boomerang of Karma. What goes around comes around. For those receiving a no: It hurts, yes, but . . . Back to that list above from Seth. More often than not, no is not about you. George Costanza might have used that old “It’s not you, it’s me” line to get out of things, but . . . In the real world, often no really isn’t about you. Move on with your art. Let it inspire you instead of being an anchor, weighing you down. That was powerful. Hearing NO stings- but you have remember that it is rarely personal. Callie, this is a valuable reminder for us all, whichever side of “no” we are on at the moment. This lesson really came to the fore in my life some years ago when I began telecommuting several days a week for my work. Friends and neighbors assumed that since I was at home, I was “available” for lunch, the movies, whatever. It took a while and many, many “no’s” to remind them that I am working. I do the same thing with my writing time now. Great post – thanks! When someone makes my “no” personal despite the fact that I teach them during my “no” that it isn’t they’re signalling that they’re the wrong partner for me. Awesome Callie. I think it’s important to remember that someone saying “No” is often the worst that can happen, and it isn’t that bad. Much worse to say it to ourselves. A thought about your encounter, because I too have not liked to say “no,” on the false premise of not wanting to hurt someone’s feelings. It’s worse to vacillate, or to say yes and not do, or to say yes, do and be resentful. Manipulators count on the weakness of our “no.” “Not no” needs confidence. The odd thing is that a “no,” properly delivered, can be very empowering. The first rejection letter I received was so thoughtful and encouraging, it’s been an inspiration for decades. We don’t always have the time to explain the “no” in detail, and not everyone who receives a “no” (rejection) will understand or accept it. But, as you said, politeness and empathy and as much explanation as possible go a long way. 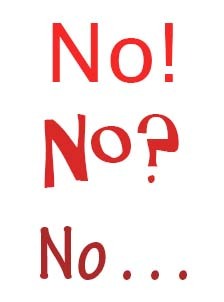 “No” is part of the process, and part of the practice – like an athlete before a game or a student submitting a paper, corrections make the product better. Even form rejections teach us something, if only about ourselves. And the better we know the subject of which we write, the better the artistry. It’s often more than “I’m too busy” …it’s “I am constantly barraged with 100 times the requests I could fulfill if I did nothing else but fulfill requests instead of doing that thing that makes you want to request something of me.” It doesn’t mean we shouldn’t ask…just that we also shouldn’t forget that we may be one in a million…and not in a good way. Very well stated, Callie. Ultimately someone else’s no is not about us. As artists, entrepreneurs, or whatever, if we choose to succeed, then we also choose to keep pushing forward and making things happen. Getting or giving a “no” is part of the process. Thank you very much for providing this perspective. I enjoyed Seth Godwin and Jonathan Fields’ posts as well. No hurts. It’s hard! Especially if you are a people pleaser–or you just genuinely want to help people. The ultimate soother for “no” is just offering a resource and it really helps/encourages others in my experience. For example, just saying, “no, I’m afraid I can’t but have you tried XYZ (website/person whatever)” that can shift the entire focus and also show you genuinely want to help. I host a radio talk show that airs on more than 100 stations across the country. The most important part of my job is guest selection. Steve’s told me no, Seth’s told me no — and I assume Jonathan will, too…when I get around to asking him. Getting a no is kinder than getting a ‘maybe someday’ — especially when that means no — and I do two things when I hear it. I give myself credit for the asking, and I take the answer as permission to move on to the next person. No big. The main reason I do the talk show is to learn something. Steve and Seth and Jonathan are generous with what they’ve learned. Interviewing them isn’t the only way to avail myself of their wisdom. One day I hope I’m so swamped with media requests myself I have to turn many of them down. When that happens I’ll remember people I admire who showed me how to do that, with class. I came across a Postcard to a Young Poet yesterday (not from Rilke, but from Amy Lawless). Your blog made me think of the postcard. I loves you and you must love you too. The world will say no to you many times before it says yes. A few years back I decided to send out 3 letters a week to art publishers, galleries, and more to show my art on other product such as prints, puzzles, cards, calendars. I made a decision that no matter what I was going to stay at it until I got a yes. I got lots of “NO’s” but because of my commitment I would just say…next! And another 3 letters would go out. eventually I got my YES and I learned its not for me to judge a no but it is for me to keep going toward my YES. Thank you Callie for this reminder. Awesome. Thanks for the transparency and honesty in your experience. Also thank you for sharing the links to the other articles, I had missed those. Then I would be rich/validated/happy. And would not have to feel the pain of “no” anymore. Your post is an important reminder of who’s responsible. Thank you. Not trying to portray myself as a saint or anything but I often find myself spending time helping others at a cost to my own work, priorities, and interests. I have a hard time saying no. Even to people that deep down I feel have a negative impact on my life and I am trying to distance myself from. Within hours of reading this I was approached with the decision to reluctantly say yes or go the less traveled route and say no. I can’t even remember the last time I said no to anyone. Granted it was a relatively small favor this time but it was time that I had scheduled in my day to meditate, and it was a person that has brought almost nothing but negativity to my life. Be that as it may, I found myself still feeling obligated to type the word yes to respond to the text that requested that I drive across town and lend $20 to an ex-girlfriend. In that split second before I hit send. I thought back to this blog. I thought about Resistance. Then I said, “No” and explained why to some degree. I have to admit, it kind of felt good. Not necessarily because I said no to her, but more so because I was aware and able to make the conscious decision to make my work a priority. Thus, winning a battle against Resistance. This post is “spot on” and I’m sharing it with my students. “No” means “no”, nothing more, nothing less! I have to tell people no a lot in my business. I never thought I’d be in that position but here I am. Mostly, my reason is that I am super, uber, always backlogged and I just need to quickly clear things up. Sometimes, if someone emails me a few days later, or a week and is persistent, I will take some time to carefully consider if I want to buy their collection or not. Other times, they just have junk and I can’t sell it. In that case, I tell them outright and sometimes give examples. Too often, we are looking for mommy to validate us. That mental model must be destroyed as quickly and efficiently as possible or we will suffer and suffer and suffer. Mommy ain’t gonna put our stuff on the fridge no more. I probably read this in 2013, but this is a message I need to hear 100s of times. To reject rejection is hard. To not take personally something that I’ve poured my heart into is a challenge. Steve’s answer seems to be Me, Inc. I like that, but there is a difference between knowing something intellectually and kinesthetically. I must learn things in my bones for them to stick. Timely post…I’m out finding sponsors and community partners for our race. 100s of nos are in my future. This makes me think about Shel Silverstein’s book, “The Giving Tree.” Yes, we could read it as a parable of selfless love. Or — a cautionary tale that if you always say “yes,” you’re likely to end up no more than a stump. Wow. Powerful. Thank you for the repost. I may have been on hiatus from Seth’s blog or just missed this one. So glad I got a second chance to see it. Thanks. To feel good about ourselves and feel special. There is no such thing as NO! Then NO becomes a mere word – It has no power. Thank you again. Lots to think about. And! As I gear up to work as my own publicist for my fledgling podcast and send pitches far and wide, on a personal level, this post and the ones that inspired it were so helpful and timely.